May 4, 2012 SOLD OUT! Ellie was born on January 26, 2009. Ellie's dam is D & S Harley Girl and her sire is White Oak's Ready to Rumble MH. Ellie earned her Junior Hunt Title on June 12, 2010 in Elkton, MD. She weighs about 70lbs and is one sweet girl. She is currently training for senior and master hunt tests. As of 11-7-11, Ellie has 2 senior passes. Honor is a very well structured 80 lb black male. He became a Junior Hunter as a puppy and was placed with a professional field trial trainer to develop his abilities. He had 8 derby points and was a consistent finisher in the derby stake as a young dog, and became Qualified All Age at the age of 2. While it’s tough to become a Field Champion, to gain those points and the elusive win, Honor became an FC in two Blue Ribbons! 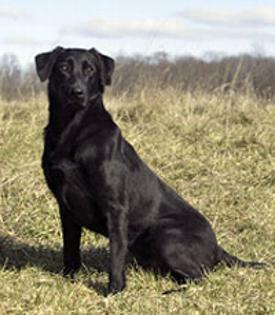 His sire is the famous FC AFC Teddy's Ebonstar James, who had 92 all age points at the age of 6, qualified for 5 nationals, and was the youngest dog at the 2000 National Amateur Field Trial and a two time National Amateur finalist. Honor’s dam, FC AFC Dutchman's Gold Midnite Eve, had 68.5 all age points, and a 2x National qualifier, is also noted to be a consistent and willing worker. Honor’s littermates include 1 FC-AFC and three other Qualified All-Age dogs. Honor is owned by Susan Bledsoe of Justice Retrievers. More information may be seen on her website at www.justiceretrievers.com. Dew claws were removed on 5-8-12. Pups will be wormed at 3, 5, & 7 weeks, and pups will receive their 6 week vaccines and be vet checked by Dr. Sam Yoder (6-22-12). Born and raised in our home….well socialized.